Surrounded by the tolling of Big Ben and of the big city bells all around, we will be ringing bells for three minutes for the Olympic Truce and the Millennium Development Goals, starting promptly at 8.12am. Arrive by 8am at the latest! There’s been a huge response to this unusual and fun event! If you are not ringing bells locally, please come to central London and join in. Don’t forget to bring a bell – any bell – bicycle bell, cow bell, toy bell, ankle bells, ringtone, anything. The Olympic Truce flag will be flying from the middle of the Millennium Bridge from 7.30am – try to arrive by 8am at the latest so that we are in position by 8.12am to ring for three minutes. We would like to congratulate you on your initiative and your support on Olympic Truce goals! It will be a very nice opportunity to remind the world that Olympic Truce ideals can inspire the generations. The event is part of a nation-wide All The Bells work by artist Martin Creed and bells will be rung across the whole country for three minutes from 8.12am. We are ringing to support the Olympic Truce and the Millennium Development Goals. We will be welcoming visitors from the Foreign & Commonwealth Office, the Department of Communities and Local Government and the United Nations Association. The UN Secretary-General’s Special Adviser on Sport is also hoping to be with us. Kostas Hazkis (right) will be joining us tomorrow morning. We are all invited to celebrate our countries of origin and London as a multifaith and multicultural city. 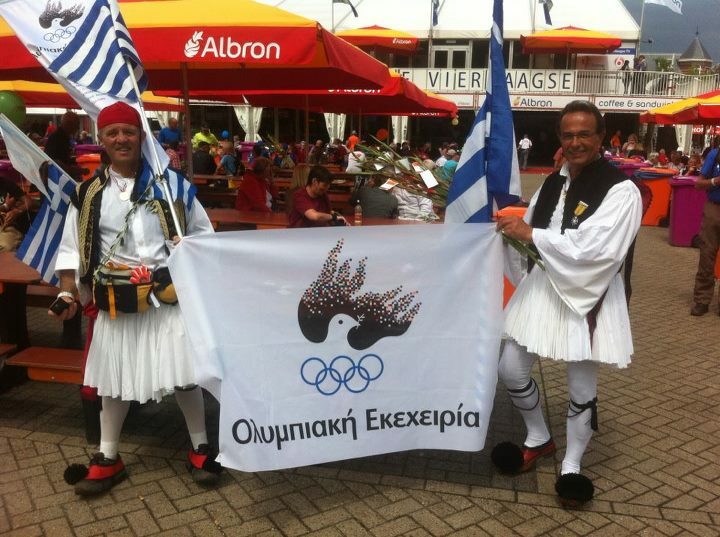 News has travelled abroad – Kostas Hatzis, who lives in the Netherlands, will be arriving in full Greek national costume. He has promoted the Truce with a 4-day walk. We are all invited to follow his lead in celebrating our countries of origin on the day that the world comes to London for the Olympic Games Opening Ceremony. We know it is a big ask for those who are observing Ramadan to join in at this early hour, so we are especially pleased that many are coming along. Everyone ringing a bell will be filmed and the video will be downloadable after the event as a souvenir of a very special and historic occasion. For those who prefer not to ring bells or be filmed, provision has been made so that you can join in to the full. More information on the Olympic Truce, the Millennium Development Goals and the event itself can be found on the links on the flyer, which you can download here. There is also a Facebook page for the event – please share through Facebook and the flyer. If you have not yet let me know you’re planning to come, please email me asap! This entry was posted in London 2012, London Peace Network, Olympic Truce, Peace-building and tagged All The Bells, Martin Creed, MDGs, millennium bridge, Millennium Development Goals by Catriona Robertson. Bookmark the permalink.